﻿ Tuscany Cuccini - Ohio. Find It Here. Whether you are looking for a delicious authentic Italian pasta dish, homemade style pizza, or just a place to grab a refreshing cocktail with family and friends, Tuscany Cuccini is the place for you. Tuscany Cuccini is well known for cozy family gatherings, fast and attentive service, wonderful food, and reasonable prices. 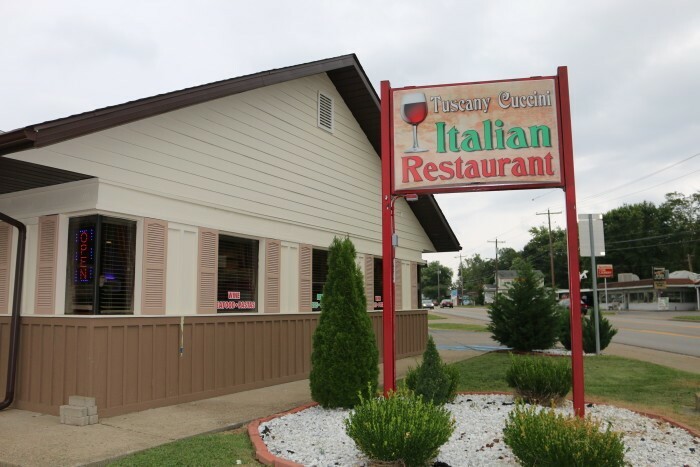 We pride ourselves on offering you a comfortable setting where you can enjoy authentic Italian cuisine.Tuscany Cuccini is a family owned and operated Italian Restaurant located in Gallipolis, Ohio. At Tuscany Cuccini, our combination of fresh ingredients with authentic Italian cooking add up to a dining experience you'll never forget. We will make sure you are served the most authentic and fresh Italian dishes, while offering the best customer service. For lunch or dinner, dine in or take out, from appetizers, and salads to chicken, steak, pizza, and Paninis, as well as desserts and wine, our kitchen committed to providing our guests with the best traditional Italian Cuisine. Whether you have always dreamed of the Italian countryside or come from an Italian family yourself, Tuscany Cuccini beautiful cuisine and warm, traditional atmosphere can take you back to that delightful Italian memory.